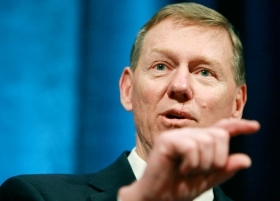 Mulally believes it is a high priority to to return Ford to the investment grade debt-ratings that it lost in 2005 and reduce the company's interest payments. HANNOVER (Bloomberg) – Ford Motor Co.'s venture with Russian automaker OAO Sollers will accelerate the introduction of Ford vehicles in that market, CEO Alan Mulally said. Ford agreed on Feb. 18 to set up the 50-50 venture with Moscow-based Sollers to assemble and distribute vehicles in Russia. Ford Sollers will manufacture Ford models at plants near St. Petersburg and in the Republic of Tatarstan, east of Moscow. As auto demand in western European heads for a fourth consecutive year of decline, manufacturers are closing deals in Russia, where passenger-car sales may reach 3 million by 2014 to surpass Germany as Europe's biggest auto market. Ford will "clearly" manufacture at least 300,000 cars locally a year, a criteria that needs to be met to qualify for Russian tax and tariff breaks, Mulally said. Sollers agreed on the Ford deal as it backed off from a separate deal with Fiat S.p.A. Fiat is in talks with "several" potential partners for a new venture, Sergio Marchionne, CEO of the Italian carmaker that runs Chrysler, said Tuesday at the Geneva auto show. Net income at Ford, the only major U.S. automaker to avoid bankruptcy in 2009, plunged 79 percent in the fourth quarter as European operations had an unexpected loss and costs rose for introducing models such as the Focus compact and Explorer SUV. Ford earned $6.56 billion in 2010, its biggest full-year profit since 1999. The European division is "on track" to return to profit this year, said Stephen Odell, CEO of Ford's European division, in an interview. Ford is "doing the right thing" in resisting price cuts in Europe, as raising market share "doesn't pay the bill," Odell said in Geneva. Mulally said that "it's a very high priority" to boost profitability and free cash flow, in order to improve the balance sheet and to return Ford to the investment grade debt-ratings that it lost in 2005 because of rising gasoline prices and falling truck sales. "It would be of tremendous advantage" to get back the investment grade rating. On a $14 billion loan, it would save $1 billion in interest payments each year that Ford could use to invest in products, Mulally said. Mulally declined to predict whether Ford will get back its investment-grade rating this year, saying "we believe our profitability will be better in 2011 than in 2010 and positive free cash flow so that clearly gives us good options to continue to improve our balance sheet." The CEO said today he has no plan for retirement. "I'm absolutely honored to serve Ford," he said.